When Everton moved away from Anfield following a disagreement over rent John Houlding was left with a football ground and no team. Cue the creation of Liverpool Football Club. Houlding and W E Barclay remained at Anfield to help form the new club with local businessman John McKenna being appointed to the club’s first committee. Following their inauguration, Liverpool made an immediate application to join the Football League but this was rejected and they had to take a place in the Lancashire League instead. They won that championship in a tight contest with Blackpool and when the Second Division of the Football League was extended at the end of the 1892-93 season, the club was elected in favour of their neighbours, Bootle. The side's first manager would be best described as a dual role between W E Barclay and John McKenna. Barclay was the actual 'secretary/manager' of the club during this period and had been involved at Liverpool before John McKenna, who seems to have acted as a 'coach/manager'. The tremendous work achieved by Barclay should not be overlooked, as he was the organisational force that helped create the great 'Team of the Macs' and the early successes of the club. However, it was McKenna who seemed to be more involved with team affairs and he could not have had a better start to his new career, beating Rotherham Town 7-1 in a friendly in our first ever match on home turf on September 1, 1892. Due to his trips north of the border to acquire players, the first team he fielded, had no Englishmen. They were known as the team of 'Macs', with McBride, McQueen and McVean to name but a few. At the end of the first season, McKenna - also acting as secretary to the club - had written to the FA without anyone's knowledge, and requested election to the Football league. McKenna's vision for the club was now apparent. Due to the old test match system, and no automatic promotion, Liverpool found themselves in a play-off situation with last placed Newton Heath (Manchester United). They eased to a 2-0 victory and in doing so finally achieved First Division status. Despite relegation in 1895, Liverpool became known for their fighting spirit and began to flourish. 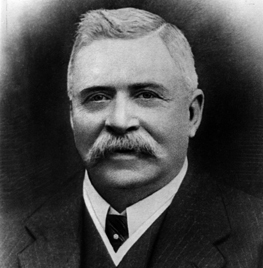 In 1915, McKenna handed over the chairmanship to WR Williams, but remained at the helm. By this time, McKenna had become a well respected figure in football. After serving Liverpool for over 40 years, 'Honest' John McKenna died in March of 1936. Like John Houlding, his friend and business partner before him, his coffin was carried through the city by three Liverpool players and three Everton players and a commemorative plaque to him remains in the foyer in Anfield. © Copyright 2010 Liverpool FC. All rights reserved.